Growing up on a farm in the middle of Missouri with six siblings, I had little exposure to art and painting. The small school I attended in my first ten grade levels only offered the basics which did not include art. In spite of that, I always occupied myself with some form of art, often sketching from photographs found in magazines. The painting I did back then was limited to school projects, tempura paints, and paint-by-number oil sets. In my eleventh year of school, I attended a larger nearby school which to my delight offered a few basic art classes. These classes mainly consisted of drawing instruction but I thrived on it. After high school, I attended Central Missouri State University acquiring a degree in commercial art or what would now be called graphic design. Along with all of the design classes, I was exposed to a variety of art mediums, methods, and styles. It offered the opportunityto study about other artists and to explore my strengths and weaknesses as an artist. I found myself drawn to the speed of expression and the flexibility of pastels and of acrylic paints which I continued to explore after graduating and beginning a career in the field of commercial art. Commercial art did not offer the creative experience I desired. I continued taking art classes and workshops to fill my need for more creativity but as responsibilities increased my time and motivation to continue creating art decreased. After a while my time being consumed with work and family, I ceased to create art on my own. I still longed for the time and a place to be creative but had gotten to the point that I doubted my abilities as a creative artist. this doubt and lack of creative activity left me with a huge hole in my life. ​As my son grew and showed an artistic interest and ability, I began to explore opportunities for him to be exposed to the visual arts. As he took classes and grew as an artist in his own right, I began feeling that old urge to be creative myself. When he grew old enough to require less of my time, I again began to take classes and workshops for myself. At about that time I was laid off from my job and suffered a stroke, which left me thinking if I was ever going to create art and show it to the public, now was the time because I was not guaranteed tomorrow. I applied for, was accepted into a coop gallery, and began creating and displaying my work. It was so frightening and at the same time so exciting to hear the reactions to my artwork. The first time I actually sold a piece of artwork I was beside myself. Sales were slow but as I grew and began finding my artistic voice, my sales and confidence increased. I began participating in other shows and groups increasing my exposure as an artist. Eventually, I left the coop gallery and began showing in more galleries and art venues. In January of 2017, I rented some studio space from Harlequin Arts in North Kansas City, MO. 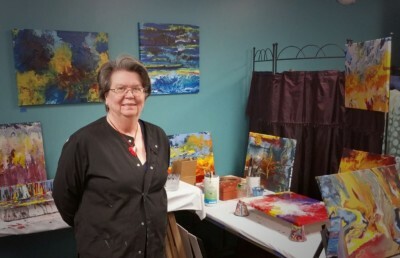 In June of 2017, when Harlequin Arts moved out, I took over the entire space at 2030 Swift, in North Kansas City, MO and set up space for displaying art as well as studio space for creating my artwork and for presenting classes. My most recent move came in June of 2018, when I moved in with DesignWerx at 1313 Atlantic in North Kansas City, MO. I am still in the process of getting set up and determining how my studio business will change based on my new location.